Theresa Rose Cadieux Blake went home to be with her family in heaven on Monday, August 27th. Theresa was born on August 22, 1928 in New Bedford, MA. She was the daughter of the late Arthur E. Cadieux and Yvonne Henry Cadieux. Theresa married the love of her life William “Billy” Blake and they went on to have 3 children. Their special daughter Betty Ann Elizabeth, who preceded her in death, Kevin John and Lisa Marie. She had two younger brothers, Arthur E. Cadieux and Ernest Cadieux, who also preceded her in death. Nothing in this world meant more to her than being with her family. She relocated to Hickory, NC from MA in 2004 to enjoy the warmer weather where she and Billy spent time meeting new friends and enjoying the sunshine. After Billy passed she moved to the Kingston Residence where she became the President of the residence and was influential in making life happier for the residents there. 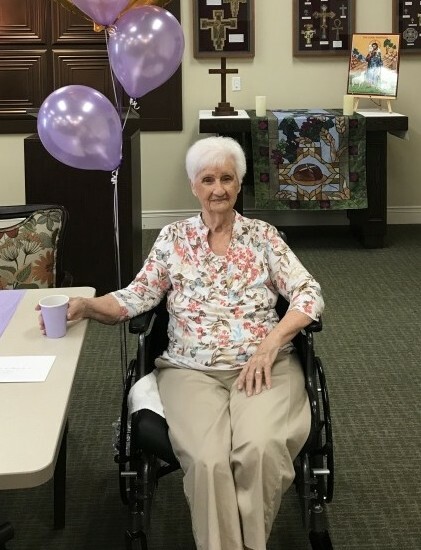 Her smile was contagious, and her heart was so warm for all the residents and staff. After experiencing some health issues, she moved to Trinity Ridge in Mountain View. Her family will forever be indebted to the nursing staff and the CNA’s. They treated our Mom with respect, dignity and more importantly, Love. Thank you all. She and her roommate, Martha Rodon built a very special bond as well. Theresa will be missed by her family and all those fortunate enough to have met her. She leaves behind two children, Kevin J. Blake and his wife, Helen of New Bedford, MA and Lisa M. Medeiros and her husband, Lou of Hickory, NC, four grandchildren, Amanda E. Blake, Kevin W. Blake, Nicholas A. Medeiros and his lady, Elise Denzer, Anjela T. Medeiros, friend, Sam Woods, her Great Grand Child Andrew Blake Limone Medeiros and his mom, Leah Limone, six nieces, Ruthie Rego, Susan, Susan C., Sharon, Lynn and Margaret, nephews Tommy, Wayne, Jimmy, Michael and wife Gorette all from the Cadieux Family, her special friends that will be lost without her companionship, Paula Cadieux and Molly Dula. Life will never be the same for us with her passing. A private service for family has been decided. Donations may be made in her name to the St. Jude Foundation. Please sign the online guestbook at www.jenkinsfuneralhome.net. The Blake family has entrusted arrangements to Jenkins Funeral Home and Cremation Service in Newton 828-464-1555.